Music & lyrics by Ian Cinch-Jones, Poly-Dolly, and Mike DeVice. 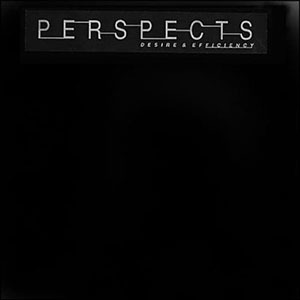 PERSPECTS invites you to listen to the effects of maximum convenience on the present-day human mind. What we feel in lieu of our modern, supplanted emotions in the domain of Desire & Efficiency. These grey areas make it a music of contradictions: sterile & emotional, sincere & sarcastic, dead serious & tongue-in-check. "Love" songs about the things we substitute for our love reflexes. This 12" is out of print.